10 things that effective teachers do- Do you? Sometimes it is just worth reflecting on our personal skills and looking at where our strengths and weaknesses are. After many years of teaching some skills will have been more developed, whilst others that are used less widely may need more work on. For me I start with this list that I picked up somewhere from the internet when I started in Management many moons ago. NB. Way down the list is questioning, if you need more help with this see the last blog. For me this list was a starting point not only for me, but for the team or teams I was leading. Not only did I as a manager needs these skills, but also the team needed the same strengths, and being able to review and see our weaknesses objectively made it easier. For example, when observing lessons it gave us all a focus that we were all comfortable with. We all recognised we were good teachers but wanted to do better, so were honing skills. This meant the threat and fear went away, this was crucial in schools needing support as too often one criticism or constructive comment can lead to low self-esteem and the fear of being a failing teacher rather than building more strengths. 10 things that effective teachers do. Effective teachers have a passion for their subject. They work hard to keep their knowledge current and sharp. Good teachers do not “wing it.” They prepare lessons carefully and thoroughly to ensure all students meet their targets. Effective teachers plan the ways in which they will judge students’ progress and they do so throughout the lesson, adjusting their teaching in the light of what they learn from the assessments. Effective teachers believe that every child can learn. They work hard to identify ways of overcoming any barriers to learning so that all students are successful. Effective teachers create learning opportunities through hands-on work, small group activities, peer-to-peer coaching, and individually guided instruction. Good teachers make learning engaging by making lessons interesting and relevant. Effective teachers understand that firm discipline policies contribute to a healthy academic atmosphere by emphasizing the importance of regular attendance, promptness, respect for teachers and other students, and good conduct. Good teachers understand that students respond to consistency, fairness, and structure. Good teachers understand that technology is a tool for increasing student interest, motivation, and achievement. Effective teachers clearly communicate their expectation that all children can and will achieve to the best of their ability. Good teachers demonstrate zero tolerance for discrimination, bigotry, bullying, or harassment. They promote tolerance, curiosity, and respect for other genders, races, and cultures. Effective teachers make efforts to know their students individually and to build openness and bridges between homes and classrooms. Good teachers create multiple channels for communications with parents and the community members. They try to see the “whole child” and provide extra help, referrals, and assistance for children facing challenges out-of-school. Effective teachers are always growing and learning. They share successes and challenges with other teachers and see themselves not as an “expert” but part of a community of lifelong learners. Effective teachers plan opportunities for students to embed their learning through talk, to one another and to the teacher. In their classrooms, students talk more than the teacher! Using Blooms Taxonomy in classrooms. What is Blooms Taxonomy? Just as a reminder this is wikipaedias entry. Bloom’s taxonomy is a way of distinguishing the fundamental questions within the education system. It is named after Benjamin Bloom, who chaired the committee of educators that devised the taxonomy. He also edited the first volume of the standard text,Taxonomy of Educational Objectives: The Classification of Educational Goals. Bloom’s taxonomy refers to a classification of the different objectives that educators set for students (learning objectives). It divides educational objectives into three “domains”: cognitive, affective, and psychomotor (sometimes loosely described as “knowing/head”, “feeling/heart” and “doing/hands” respectively). Within the domains, learning at the higher levels is dependent on having attained prerequisite knowledge and skills at lower levels. A goal of Bloom’s taxonomy is to motivate educators to focus on all three domains, creating a more holistic form of education. 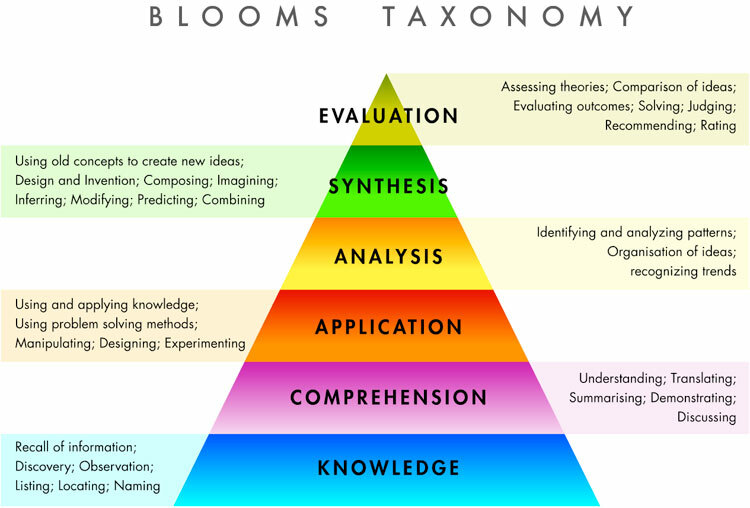 Bloom’s taxonomy is considered to be a foundational and essential element within the education community.A mythology has grown around the taxonomy, possibly due to many people learning about the taxonomy through second hand information. Bloom himself considered the Handbook “one of the most widely cited yet least read books in American education”. Teachers can move students towards more complicated work by using questions. These can sometimes be difficult to think of on the spot, but I used to write myself some when working through lesson plans and then use them when appropriate through the lesson. The first questions we think of start usually are usually factual questions e.g. Who? What? Where? and occasionally which one? These just have one type of answer and can often be determined by the way the question is asked, or are obviously right or wrong. However to develop the students understanding and skills further as teachers we need to use questioning techniques that support and show more in depth understanding. what is meant by what was said ? and then on towards evaluative questioning e.g. Which is the best? Why? What do you think are the advantages of x over y ? How do you feel about (changing the voting age to 16)? Why? Describe the food, explain how it was made. This is how it may look when you now look at asking questions. Here are the verbs from Blooms Taxonomy to support you in generating questions. Now term has really started I thought we would look at our more practical – touch, feel, do learners. They have a rather long name and are called Kinaesthetic learners. I think I must be predominantly this type as anything practical attracts me first. Probably why my subject is Design technology, resistant materials, graphic, control technology and textiles as they are all things that you do!. For Kinaesthetic learners generally they enjoy learning that involves physical experience – touching, feeling, holding, doing, practical hands-on experiences. The base of the word comes from the Greek kineo, meaning move, and aisthesis, meaning sensation Hence the name Kinaesthetic describes the sense of using muscular movement so for us teachers that means we need to look at teaching/learning experiences that include within the term some work that involves the stimulation of nerves in the body’s muscles, joints and tendons. For Design Technology, PE, Music it is commonplace to find this type of activity, but how do you ensure those with this type of learning experience it at least a few times per term in Maths for example? This is the conundrum for all of these styles how do you ensure you reach your learners and support them with their style of learning. For me having a check list per activity when planning means that over each half term I have a general idea of which style I have used mostly in order that I can change the balance over the next term or if revising a fact/ module of work find another way of demonstrating it i.e.. if It was mainly visual learning first time then revise with the visual reminder but back up with a practical (kinaesthetic) activity. If you are unsure which type you are then you can find out using the link below. This lesson plan is for lower ability students. Teaching Aim. To develop writing in preparation for GCSEObjective for board: To respond to the marking in your books, to understand GCSE requirements for higher tier, To begin preparation for Original writing coursework and be aware of the need to write to a certain audience.